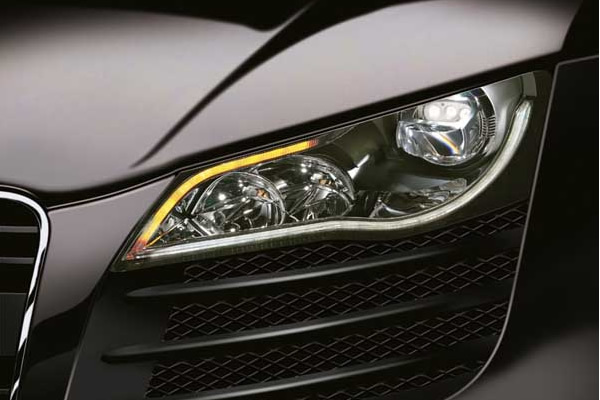 Magneti Marelli Automotive Lighting has developed in 2007 the world’s first mass-produced full-LED headlamp. It’s the headlamp produces for the Audi R8, which consequently became the first car on which all lighting functions – low beam, high beam, turn signal, Day Running Light and parking light – were developed with LED (Light-Emitting Diode) technology. The basic light distribution is produced by two free-form reflectors in the shape of a shell, supplied by LED arrays (modules formed by several light-emitting diodes), with four white LEDS each. The spot is positioned in the centre of these white LEDs. The ray of the dipped beam is generated by means of the high-performing lens system, with three additional modules with 2 LEDs. At the side, the full beam featuring two modules with four LEDs shines its light from the high- beam chambers in the shape of a shell. The greatest advantage offered by white LEDs lies in the colour of their light, which is also known as the colour temperature. Reaching approximately 6,000 °Kelvin, the intensity of their light is just about the same as the quality of daylight. The human eye perceives the road and the edge of the roadway at night in their natural colour, and can distinguish contrasts much more easily. In addition, the average useful life of the LEDs in all functions exceeds that of vehicles. On the one hand, this diminishes the possibility of breakdowns at night and, on the other, it eliminates the need for complicated light bulb changes. The first full-LED headlamp also traces the path for the future with regards to reduction in fuel consumption and emissions. The use of LED-equipped Day Running Lights also makes an important contribution to a proper energy balance, since 75% of the total driving distance in the world is covered during the daytime. Also concerning consumption reduction, vehicles adopting lighting systems based on Xenon technology for the low beam/high beam functions and LEDs for all the other front and rear lighting functions, could potentially guarantee – according to research carried out by Automotive Lighting – savings of up to 80 Watts and 2 grams of CO2 emissions per kilometer. On top of the aspects tied to advanced technology, safety and consumption, LEDs open up entirely new possibilities for the designers. Unusual contours can be realized. What’s more, LEDs look beautiful and distinctive, both during the day and at night. The last all-LED headlight generation adopts also all the adaptive electronic lighting functions of current Xenon systems. Automotive Lighting has been supplying the first all-LED headlights with adaptive light functions for Audi and Mercedes-Benz. In particular the ground-breaking new development of the Mercedes-Benz CLS all-LED headlight is another milestone in the field of vehicle lighting. Adapting the light beam to speed, road type and different weather conditions provides the driver with the best possible road lighting at night or under adverse weather conditions, increasing safety standards. The engineers at Automotive Lighting and Mercedes-Benz have developed in a close cooperations a sophisticated modular actuating concept that includes a specific electronic control system for the headlamp that, after analyzing certain specific parameters coming from the car network, detects the driving situation and automatically selects the best light distribution from seven available options: Adaptive Cut-off-line, Full High Beam, Motorway Light, Static Bend Light, Dynamic Curve Light, Night View Assist, Adverse Weather Light.